Dr. Ned Hallowell in Driven to Distraction: Recognizing and Coping with Attention Deficit Disorder from Childhood through Adulthood. I really didn't want to start the year off with a GQD featuring Donald Trump...but you can't not do some things when they're this bizarre. Is it possible that this just might be the Gibberish Quote of the Year for 2019? We'll have to wait and see...but damn, can they get any more gibberishy? 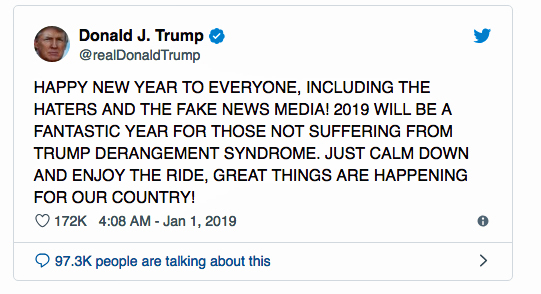 I'd like to say Happy New Year - but if this is any indication of how the upcoming year will be for you Americans (and the rest of the world that has to deal with him)...God help us all!